Granger's Performance Repel is a spray on solution designed to restore and refresh the water repellent finish found on your technical outdoor clothing. Ideally applied to damp garments that have been cleaned with a specific technical wash such as Granger's Performance Wash Performance Repel does not require heat activation to work. 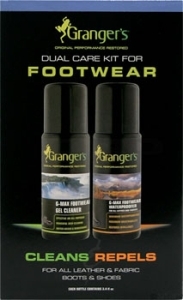 Granger's Performance Repel is suitable for use on all outdoor and technical fabrics. Your browser isn't supported for displaying eBay items. Go to eBay to search for Grangers Performance Repel.